Our Michigan birth injury attorneys handle cases involving hypoxic ischemic encephalopathy. These cases are filed on behalf of babies and children who were diagnosed with this condition after birth. This type of brain injury can be permanent and have lifelong effects on your child and the care needed for your child over his or her lifetime. Hypoxic ischemic encephalopathy (HIE) is a medical condition in which damage is caused to the brain due to lack of both oxygen and blood flow to the brain. There are two stages of injury with HIE: Stage one occurs immediately after the initial oxygen deprivation. Stage two occurs as normal oxygenated blood flow resumes to the brain. This is called “reperfusion injury” and occurs as toxins are released from the damaged cells. The two stages can result in permanent brain damage to the baby. What are Causes of Hypoxic Ischemic Encephalopathy? There are a number of potential causes of hypoxic ischemic encephalopathy that result in reduced oxygen supply. HIE has many causes, including placental insufficiency, uterine rupture, placental abruption, true umbilical knots, cord compression, maternal blood clotting disorders, fetal maternal hemorrhage, extremely low maternal blood pressure, trauma during delivery, placental blood clots, shoulder dystocia, cord prolapse, aneurysm rupture, cardiac arrest and near SIDS events. This condition can also occur in utero before delivery of the newborn. Medical negligence is a possible cause of this condition. What are some of the Symptoms of HIE? What is the Treatment for Hypoxic Ischemic Encephalopathy? Many of these therapies help improve the life of a baby with HIE. Therapy is often required for many years, even into adolescence and adulthood, to help with functioning and independence. The cost for treatment can be significant over the lifetime of the child. What are the Long Term Effects of HIE? 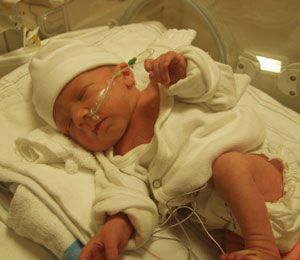 There is no way to predict the long term effects on a baby with hypoxic ischemic encephalopathy. In babies with mild cases, there is a likelihood that the child can lead a normal life with proper treatment and therapy. In more severe cases, the child can experience developmental delays, epilepsy, cognitive issues, motor skill development delays, and neurodevelopment delays. The baby will most likely be followed by a pediatric neurologist and a physical medicine and rehabilitation throughout infancy. The long term effects may not be predictable until the baby turns three or your years old. Once the child reaches that age, physicians, social workers, and educators can begin a program to provide the best medical care and education for the child. What is a Hypoxic Ischemic Encephalopathy Lawsuit? While HIE can be natural and unavoidable, there are situations where negligent medical care was the cause of hypoxic ischemic encephalopathy. When a mother presents to a hospital with signs and symptoms of a problem delivery or of a baby in distress, prompt action must be taken for the health and safety of both mom and baby. Many times, an emergency c-section or other prompt medical care can prevent hypoxic ischemic encephalopathy. Also, failure to timely diagnose and treat a newborn with hypoxic ischemic encephalopathy can give rise to a birth injury lawsuit for medical malpractice. To prove this type of case, it must be established that the child had hypoxic ischemic encephalopathy, it was not timely diagnosed or treated, and if it was properly treated then the newborn would not have suffered any serious injury or harm. Our nationally respected medical experts review all of the medical records and fetal monitoring strips to determine if medical negligence was a cause of the condition. What is the Compensation in a Hypoxic Ischemic Encephalopathy Lawsuit? The purpose the lawsuit is to improve the lives of the child, parents, and family. Parents have great concern over how their child will be cared for when they are no longer able to do it themselves. The settlements provide funds to care for the child when the parents are no longer around or able to provide the necessary care, comfort, and housing themselves. What are the Lawyer Fees for Michigan Birth Injury Cases? You can call us anytime for free, forever. Chat with our online intake specialist. Your information will be sent directly to an attorney who will contact you. Warning: There are strict time deadlines for filing Michigan birth injury lawsuits. Call us to learn more about birth injury lawsuits & settlements.